Firefighters have had a hard time dealing with blazes that have swept Siberia and the Far East in recent months. A team of firefighters marooned in a burning forest hundreds of kilometers from help have been told to stay put in case they walk into a "ring of fire." 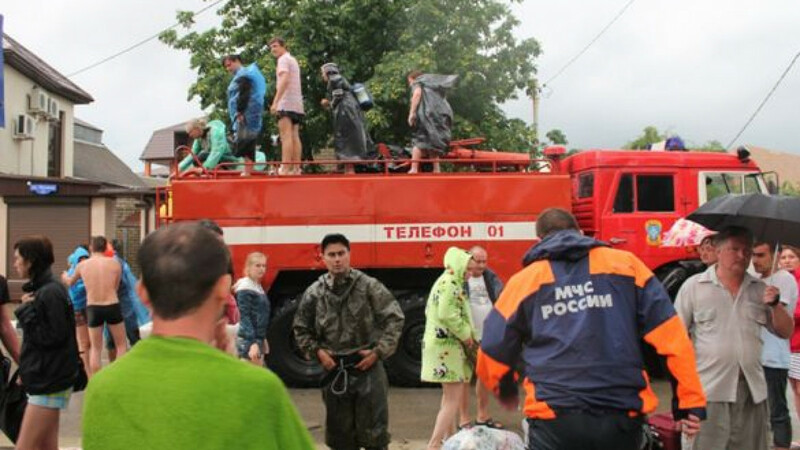 The 40 men battling forest fires in the Yenesei district of the Krasnoyarsk region have been without food since Thursday, when they were cut off by fires and thick smoke, the head of the district told RIA-Novosti Tuesday. "Groups in the region of Yashi [27 people] and Kudymovo [11 people] ran out of provisions as early as Thursday," Sergei Ermakov said. "Evacuation is impossible because of extremely poor visibility caused by smoke from fires in the region over the past several days. Aircraft cannot complete their missions." But Ermakov said he had told both groups to stay put and await help rather than attempt to walk to safety. "We are in regular radio contact with the groups. They intended to get out on their own, but we vetoed that: To get out of the forest they would have to walk more than 100 kilometers, and now, because new fires are not being monitored, they could walk into a ring of fire," Ermakov said. Authorities will only try an evacuation if the situation doesn't improve in the next two to three days, he added. Nine specialist airborne firefighters were killed fighting a forest fire in the Tyva republic in June. Fires have swept Siberia and the Far East for the past two months. The Tomsk, Krasnoyarsk, and Amur regions and the Khanty-Mansiisk and Yamalo-Nenets autonomous districts are among the worst affected. The Federal Forestry Agency said Tuesday morning that 11 blazes had been extinguished in the previous 24 hours — bringing the total number of separate fires across the country to 190, covering 21,700 hectares, mostly in the Urals, Siberia and the Far East. Greenpeace Russia, which has been monitoring the fires using publicly available data from NASA's Terra and Aqua weather satellites, has accused local officials of underreporting the extent of the fires sweeping Siberia and the Far East by as much as 90 percent. "There are at least 10 million hectares burning, no less," said Grigory Kuksin, head of Greenpeace's forest program. "The picture from satellite data is not all that precise, but it is enough to show that local authorities are reporting only about 10 percent of the fires," he said. Kuksin blamed slow reactions and "insufficient force" on the part of authorities for the spread of the fires. "Now it is already too late. They can save people and protect settlements, but they can't put these fires out," he said. Earlier this month a U.S. meteorologist said smoke from the Siberian fires was responsible for haze and red sunsets on the U.S. West Coast on the other side of the Pacific Ocean.